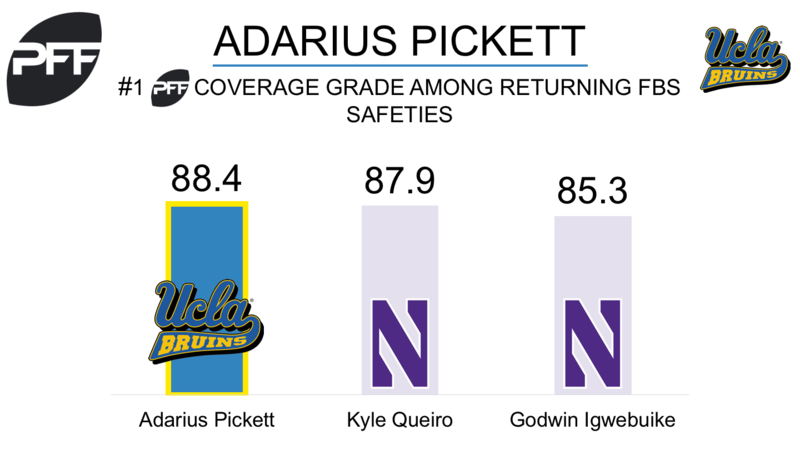 UCLA redshirt-junior S Adarius Pickett enters the 2017 college football season as a Day 2 projection for the 2018 NFL Draft. Pickett’s PFF coverage grade of 88.4 last season ranks No. 1 among returning FBS safeties. He allowed an average of 0.46 yards per snap he was in coverage, which is good for No. 26 in the class. Pickett’s overall passer rating when targeted of 58.2 ranks No. 8 among this year’s draft-eligible safeties who saw at least 30 targets into their coverage in 2016. Pickett spent 213 of his 625 snaps in the slot, allowing just 0.78 yards per snap in slot coverage. An area Pickett must improve in is defending the run as he posted a PFF run defense grade of 54.3 last season. His 3.3 tackle efficiency rating against the run ranked No. 248 for his position.